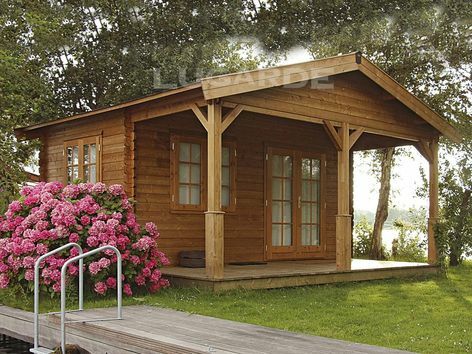 A useful sized log cabin measuring 5 metres by 3 metres. The large gable canopy with stylish posts provides a lovely place to sit and enjoy your garden in any weather. An optional larch decking floor is available. 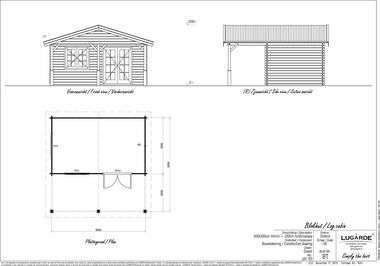 Overall size approximately 5m x 5m in 44mm log thickness. The standard package includes 2 windows PE23 and a double door PE50H and decorative post bases. 24mm double glazing is standard. The canopy measures 5m x 2m.